This bakery and coffee shop in British Columbia's beautiful Cowichan Valley deserves many repeat visits. For anyone who loves fresh artisan baking, sweet or savoury, this lovely little spot is truly a hidden gem. Saison Market Vineyard is about as hidden as a gem can be. Located in the midst of a vineyard tucked away in one of the many verdant corners of the Cowichan Valley, it is a warm and inviting little coffee shop and bakery. Part of the farm at Saison Market. Saison is the dream of a talented couple: he a chef from Quebec trained in France and she a baker originally from Vancouver Island. 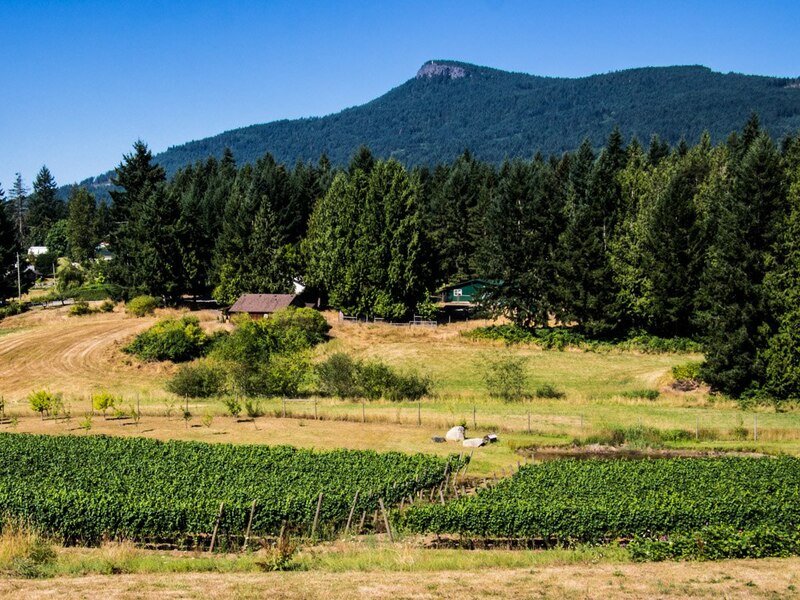 They bought a little patch of property just outside Duncan, BC and with the help of neighbours and friends, they cleared and fenced the land and planted grape vines which now produce an abundant crop of grapes. These are sold to the many wineries dotting the valley. After they grapes were planted, they opened Saison on the property, relying mostly on word of mouth for marketing. Though we’ve been here dozens of times, visiting Saison for a leisurely weekend morning is always a special treat. Saison welcomes customers with the enticing aromas of homemade baked goods, both sweet and savoury. The cozy shop is usually filled with repeat customers and has become a place where old and new friends gather. On every visit we are almost sure to cross paths with a few of our neighbours. Choosing from the mouth-watering items on display is a pleasant challenge. Will it be the rhubarb coffee cake or the delectable cinnamon bun? How about both? In fine weather, everyone takes their treats out to the large deck, which offers picture-perfect views of the vines and surrounding hills. Freshly picked farm-grown veggies are usually available for sale as well as homemade jams and jellies. Veggies picked today at Saison. Various breads, pastries and savouries are available to take home to fill your freezer. We often have a few savoury pies on hand at home. Open Saturday and Sunday only, during spring, summer, and early fall, Saison is a gem truly worth discovering. Saison is located 7 kms north of Duncan, BC at 7575 Mays Rd., North Cowichan. Diane Mountain is a luxury traveller who prefers ships to all other forms of transport. She’s been almost everywhere you might want to go, but even so, she can’t sit still for long, and is always planning her next adventure.